Rockin' Robbin Set _ Most Fun set ever! BORED with your guitar?? This set is PURE FUN! This set is modeled after Robin Trowers guitar. The sound is BIG and BOLD. The 60's Middle sounds like Hendrix and the switching positions "2 and 4 QUACK" is nicely balanced. The Bridge is a real workhorse and keeps the guitar from being too trebly! The Neck is gorgeous! The PERFECT Neck tone! This is used to evoke that 40's Jazz Big Box Sound. JUMP BLUES PLAYERS & JAZZ Cats seem to LOVE these so _ Unlike traditional pickups, The coils on the Swing0tones are fat and full to the brim with a thicker wire like they used in the 40's ! And the output is way up, however the DC ohms do read lower (in the 4's and 5's), but this has to do with fatter wire being used. with these pickups. you still get Lots of Quack in 2 & 4. smooth, full and punchy with a very sweet, low end_ with clean jazzy highs. Remember those 66' to 73' ? they were a little brighter and more "quacky" while in posistion "2 & 4". What awesome sounds and now add the "Rosie Wrap Hand-Wound Pattern". and its OVER THE TOP KILLER TONE!!.. Stagger is slightly modernized for plain "G" string. **NUMBER ONE BEST SELLER! **"Super Sport Set"
Style Specs" to be found! said to be the very best EQ-ed ever! THINK "SRV's" #1, soulful, jazzy, and full on rock and roll machine! open - organic- alive at the fingertips - never dull or Icy! - just 100% pure inspiring tone from the past that created that "Vintage Craze" and drove instrument prices to the sky. its back and can be in your hands again! make them yours today. *NOTE* any RW/RP middle pickup - Is done by email request only! "AKA, The West Coast Swing Aces"
Musical voiced, Organic, and they feel absolutly Alive in your hands! Organic, and responds to players touch feel and every whim! Super Bell toned, and with an over the top very 100% real vintage sound! The Bridge is a big fat overwound Formvar 50's it does the BB KING thing to the bone!! SUPER WEST COAST SWING STYLE MONSTERS! Never metallic / harsh /Ice-y or spik-ish! There's plenty of treble and highs to go around, BUT NO MUD! The wind style is my 100% Cloned Vintage Wrap. I use this same warp on everything I make here. It has a history of being the best wind pattern that ever left Leo's Fiddle Factory all those years ago! Designed to duplicate a very special mid-sixties pickup set that had a factory signiture on them! And the pickguard from a Josie/Vaughan was the owner of this guitar. Very popular set with the vintage purist crowd. One of our best sellers! THE NIGHT~FLYERS The Working Musicians Set, Covers more ground! This set is the -go to - do all- set! 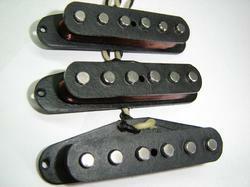 Designed to duplicate a very special early fifties pickup set.Features my cloned vintage wrap/wind and formvar wire. Very popular set with the fifties vintage purist crowd. 3- Is the guitar Bright or Dark ~unplugged~? White-0-tones specs= 5.7-5.8-5.9 bridge Formvar, these are good for, -SRVHENDRIXMAYER- The set nails that big sound! loads of fun to use!